The city of San Diego and other agencies Monday launched a pilot program aimed at providing substance abuse help and social services to chronic misdemeanor offenders. The San Diego Misdemeanants At-Risk Track — or SMART — has been under development for several months and includes partnerships with the San Diego Housing Commission, police and sheriff’s departments, Family Health Centers of San Diego and the American Civil Liberties Union, among others. 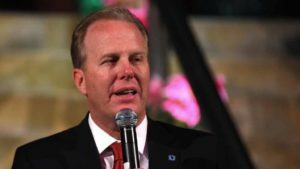 The offenders targeted by the program are heavy users of public resources and are resistant to receiving help that would turn their lives around, said Mayor Kevin Faulconer. City Attorney Jan Goldsmith said the criminal justice system isn’t equipped to deal with such people, who continue with their offenses because they don’t face consequences for their conduct. City officials said the population of chronic low-level criminals has risen in San Diego since state Proposition 47, which lowered penalties for certain crimes, was implemented. The program, which will start in the San Diego Police Department’s Central Division in and around downtown, will focus on people with acute drug addictions and social service needs, particularly those arrested since Proposition 47 took effect in 2014. Police, prosecutors and social service representatives will offer the SMART program participation during routine contacts, arrests, arraignment, sentencing and while suspects are in custody. Incoming City Attorney Mara Elliott said she fully supports the program and will seek additional state funding to expand it while she’s in office.